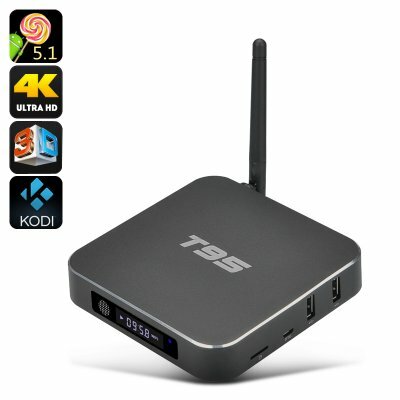 Successfully Added T95 4K Android TV Box - Quad Core CPU, Wi-Fi, 8GB ROM, HDMI 2.0, 3D Support, Kodi to your Shopping Cart. Make the most out of your home TV experience! With 4K output, pre-installed Kodi and 3D support – what else could you ask for? Reimagine what entertainment at home can be like. The T95 Quad Core Android TV Box brings 4K output to your TV screen, letting you watch the latest blockbusters, sports matches, concerts, documentaries and more with the best quality imaginable. See every drop of sweat in a boxing match, feel the wind in your hair watching a motorbike race or feel what it's like chasing a bad guy down New York streets. 4K resolution brings all the magic of TV experience right to your home. The TV media player lets you start the fun right out of the box with pre-installed Kodi version 16.0. With the tool ready and waiting, you can start enjoying your media right away. With 3D support, the TV box will also let you watch movies juts like in the theatre. With DLNA, Miracast and Airplay support, you will have lots of content options. The TV box will let your store internally (8GB) or externally (32GB). Thanks to H.265 decoding, you will also be able to store all the needed media efficiently without them taking up too much space. The T95 Quad Core Android TV Box comes with a 12 months warranty, brought to you by the leader in electronic devices as well as wholesale Android TV Box..
Entrega por fedex rapido, es un poco mascaro pero vale la pena pagarlo entrega a Mexico excelente paquete y el producto todo muy bien.